Ever heard a 4-year old speak this way? Chances are that you haven’t. In fact we often come across parents who force their kids to attend various classes. But Nitya Narasimhan was different, very different. At the tender age of four, this talented dancer had discovered her true passion. Such was her love for dance that she wanted to spend the whole day at her dance school! A trained Bharathanatyam dancer, Nitya continued this journey through her school years. It won’t be a surprise to know that she was a part of the prestigious Dance Troupe of NIT Trichy, from where she graduated in Instrumentation & Control Engineering. Now let me pause and tell you, this isn’t yet another story of an artist who quit her 9 to 5 job to pursue her passion. This is about a practical dancer who, with a firm mindset and will power decided to make changes to her mind and body to master something she knew she was meant for. Following graduation from NIT Trichy and landing up with a lucrative job in Oracle, Nitya Narasimhan, who hails from Chennai moved to Hyderabad where she found her life filled up with fun and friends. Even in her work place she would instigate dance events and workshops just so that she could be connected to dance. For almost a year she kept searching for a good dance class in Hyderabad and having found none got herself transferred to Bengaluru to enrol into serious classes. One fine day, she was invited to attend a dance show where she came to know of the Post Diploma Course in Dance in the Attakkalari Centre for Movement Arts. The following Friday she wasted no time and was auditioned. She cleared it but there was a clause that stipulated enrolment on the very coming Monday! This would mean several things – quitting a full time job from an MNC, convincing her family and everyone around her that she knew what she was doing and making all the changes possible to her lifestyle. But Nitya didn’t have to think twice. She sent in her resignation! What followed suit was waking up at 6.00 a.m, practising yoga, intensive classes in contemporary dance, ballet, movement arts, kalaripayattu and the like, sacrificing her social life, performing at various stages, dance shows – even during weekends. “You have to keep your focus. Your social life takes a hit. Weekends are when performances and workshops usually happen so most weekends are packed. And if at all a weekend is free, I utilize it to re-energize or spend time with my family“. Asked if she did mind any of it? At the end of the course, she decided to pursue Bharathanatyam and approached Raadha Kalpa, a renowned classical Indian Bharatanatyam dance company dedicated to the promotion of art and culture. Nitya knew that if she had become a dancer there, it would take a couple of years and tremendous hardwork. She decided to train under the prolific Rukmini Vijaykumar the founder of Raadha Kalpa. What comes next will totally leave you awestruck. In just one month, she was a part of the company’s next production which was a dream come true for her! Following that, she took up several production management responsibilities and within no time scaled up to become a Programming Director in the company. 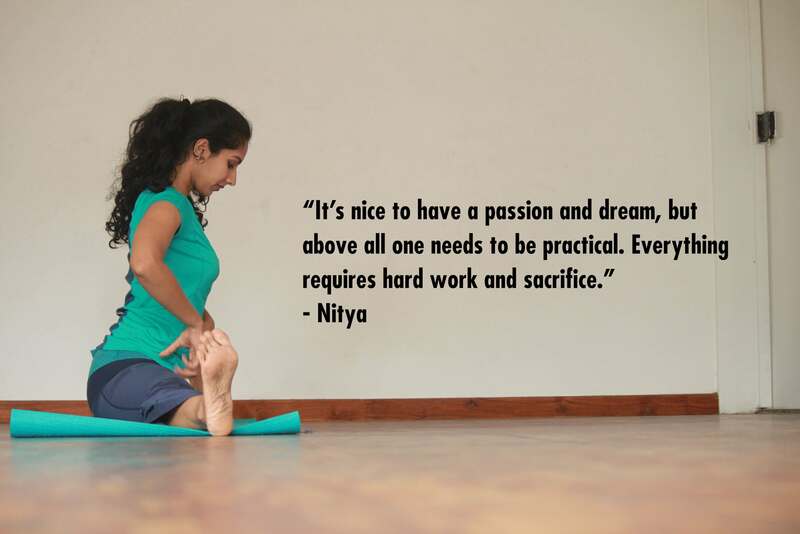 This speaks volumes of Nitya’s hard work and dedication! Her typical day now includes waking up at 5.00 a.m. and driving down to the academy, a neat 25 km away from her home. Classes begin at 6’O clock in the morning and twice a week she practises Pilates as well. After that she has advanced classes under her teacher Rukmini. This goes on till noon. Post lunch she spends time working at the LshVa Art space catching up with her various duties as an Arts Manager, coordinating with artists, organizing and scheduling events. This is followed by dance lessons in the evenings with kids who come to the academy. If her teacher is in town she also gets trained to teach. Phew! Just listening to this routine makes me exhausted! And to think of it, during our conversation not once did Nitya mention about ever feeling tired. In fact it seemed like she had energy to do a million more things! In the last two years this diva has performed at various arenas – corporate forums, artistic forums, festivals and temples. It might all seem so simple to a common man but being chosen to perform at any of these arenas requires tremendous commitment and recognition. She has also been called by her alma mater NIT Trichy to perform and judge several times. Right now she has decided that she wants to be a performer and choreographer first. “I want to start creating work and performing even more and when I feel like I have something to give back, I will start to teach. I don’t think a dancer can ever be satisfied with how much they learn because there are so many new things we discover each day”. Asked if she has a message to give youngsters who look up to her? And what does she have to say about dance? More power to you Nitya!